TV show dates: December 16, 2016 — present. Performers include: Brit Marling, Emory Cohen, Scott Wilson, Phyllis Smith, Alice Krige, Patrick Gibson, Brendan Meyer, Brandon Perea, Ian Alexander, and Jason Isaacs. From creators Brit Marling and Zal Batmanglij, who star and direct (respectively), The OA TV show is a science-fiction mystery drama with a supernatural bent. The story centers on Prairie Johnson (Marling), an adopted young woman who is blind when she goes missing. Several years later, she returns to the community in which she grew up, with her vision restored. Upon her return, Prairie refers to herself as “The OA,” and refuses to reveal to her family, or to law enforcement, where she has been all this time. Instead, she builds a team of community members, tells them her tale, explains her new abilities, and asks for their help to save other people. What do you think? Do you like The OA TV series? Should this Netflix TV show be cancelled or renewed for another season? 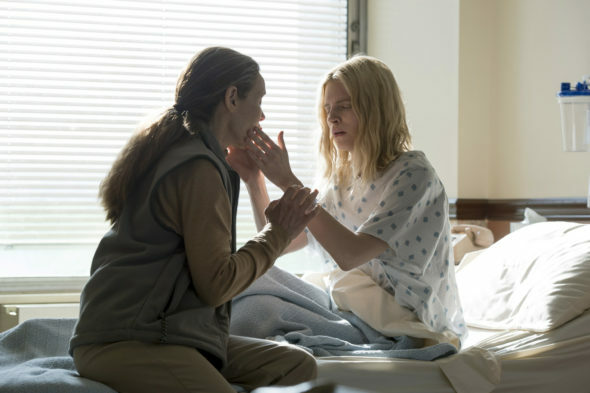 The OA: Is the Netflix TV Show Cancelled or Renewed for Season Three? Very intriguing series, woukd very nuch like to see the 2nd season to see how or if she goes into a different place.